Burnt Tongues is a collection of transgressive short fiction. It is also a term for the transgressive genre itself. Chuck Palahniuk defines "burnt tongue as "a way of saying something, but saying it wrong, twisting it to slow down the reader. Forcing the reader to read close, maybe read twice, not just skim along the surface of abstract images, short-cut adverbs, and clich�s." It also focuses on the things most people don't want to talk about, the darker sides of ourselves that we don't admit to having, the darker sides of society we would all like to think don't exist. It is a different kind of horror -- a truthful, real-life, undeniable sort of horror that is scary because it's true. Like a burnt tongue these writings will take things you thought you were familiar with and make them taste different, and although the experience may be painful at times, it may come to change your perspective on pain in general. If you're into that sort of thing. Burnt Tongues is a must read for all fans of transgressive fiction, Chuck Palahniuk and all his similarly disturbed contemporaries. Here is a quick look at what you can expect from the unexpected. "Live This Down" by Neil Krolicki -- Three soon-to-be high school girls gather in a hotel bathroom to commit group suicide. Why would they throw away their lives, you ask? Well, let them tell you, and as they do they learn that, no matter how clean and painless their plan may be, death is never easy, it is dirty and painful, and these situations never end well. "Charlie" by Chris Lewis Carter -- Some people live their whole lives trying to make up for one terrible mistake. Sometimes, just sometimes, they get a chance to actually make things right. "Paper" by Gayle Towell -- Emotional scars take the longest to heal, and when they run deep enough they wear down the soul, sometimes until it is as thin as paper. "Mating Calls" by Tony Liebhard -- The difference between man and the other animals is our unnatural desire to deny our own nature. We should really learn not to do that. "Melody" by Michael De Vito, Jr. -- Dougie loves Melody. He loves her so, so much. He buys her things and sings to her and loves her and snaps his fingers. Dougie doesn't like her kissing other men. "F for Fake" by Tyler Jones -- "At the end of the day, your life is just a story. If you don't like the direction it's going, change it. Rewrite it. When you rewrite a sentence, you erase it and start over until you get it right. Yes, it's a little more complicated with life, but the principle is the same. And remember, don't let anyone ever tell you that your revisions are not the truth." "Mind and Soldier" by Phil Jourdan -- The savagery of war teaches its lessons in a moment, but the effects last a lifetime. Once a man witnesses hell is there ever a way for him to forget? 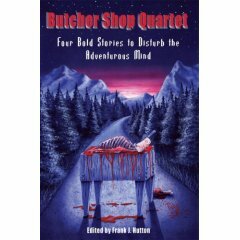 "Ingredients" by Richard Lemmer -- When Morris and her fellow female grocery clerks learn a new, nasty, little game they decide to play it for themselves, but the seemingly smallest of lies can lead to the most dire of consequences, leaving some with memories that cannot be forgotten, no matter how hard they try. "The Line Forms on the Right" by Amanda Gowin -- This one is really too obtuse for its own good. The writing is good and it tries hard, but it just misses the mark. "A Vodka Kind of Girl" by Matt Egan -- It is always hard to lose a friend, especially when you feel like there must have been some way to save them. "Gasoline" by Fred Venturini -- Larry Benton has scars. He has learned to live with them, to ignore them, to hide them. But the sacrifices and lies they led him to will pain him for the rest of his life. "Dietary" by Brandon Tietz -- Miranda Pritchard is an ex-beauty queen who has fallen from grace to obesity. All the diets have failed to curb her appetite. But when an invitation to her class reunion, where she could be restored to her former glory, arrives in the mail, she grows desperate to recapture her old beauty. And desperate times call for desperate measures. 100% effective type measures. "Invisible Graffiti" by Adam Skorupskas -- They say love conquers all. What they don't tell you is that sometimes even love cannot overpower constant sorrow. "Bike" by Brian Howie -- Life can change in a moment. Even the most innocuous of days can suddenly turn to tragedy. This is why we should never waste a moment. "Heavier Petting" by Brien Piechos -- I have to say that this is one of the most disturbing things I have ever read. Mr. Palahniuk himself must have cringed a few times while reading this one. Brien Piechos is seriously twisted and wonderfully talented. His writing is masterful, his imagery horrifying. This was a hard story to get through, I really had to force myself, but also in the end maybe my favorite in the collection. This is quintessential transgressive fiction. Just remember, you can't unread it. "Engines, O-rings, and Astronauts" by Jason M. Fylan -- Justice can only be properly dispensed through wisdom. When children choose to dispense their own justice the outcome is typically worse than the initial offense. "Lemming" by Terrence James Eeles -- This one is just confusing. At some point the writer needs to let the reader in on what the story is actually about. Is the brother dead? A serial killer? Some sort of quantum anomaly that causes death wherever the brother goes? It really never comes clear and without some sort of clarity it just doesn't work. "The Routine" by Keith Buie -- Insomnia takes away your focus and ability to function, making it hard to perform typically simple tasks. Add it to a job where people's lives can hang in the balance, and it is a prescription for disaster. "Survived" by Gus Moreno -- Death as seen through the eyes of a child can be both a beautiful and horrible thing.